Time to see if Hugo Chavez really has the intellectual horsepower to read and comprehend Noam Chomsky, Karl Marx and Friedrich Engels! 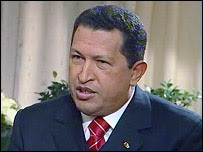 Tonight at 10:00pm EST, the Barbara Walters interview with Hugo Chavez airs on ABC. Click here for info. Chavez’s thoughts on a CIA/Venezuelan dissidents conspiracy to assassinate him, President Bush’s imperialism and the 2008 U.S. presidential race are among the topics discussed. Tune in, it should be interesting. College basketball and Venezuelan socialists…how much better can a Friday evening get?